Does al-Qaeda have a network in Canada? Security experts say a thwarted plot to derail a passenger train on a route between Toronto and New York is proof of the lingering influence of al-Qaeda in Canada. Security experts say a thwarted plot to derail a passenger train between Toronto and New York is proof of the lingering influence of al-Qaeda in Canada. "I would say its influence now is as great or greater than it's ever been, though more in an indirect sense," says Lorne Dawson, co-director of the Canadian Network for Research on Terrorism, Security and Society. Dawson says that one of the achievements of the group behind the Sept. 11 attacks was inspiring like-minded organizations and setting "an example to all these groups around the world on how to reach out and communicate" to would-be extremists. Part of its indirect influence has been to inspire "self-appointed jihadis" who take it upon themselves to seek out people willing to carry out attacks, and then pass these individuals up the line for further training by someone else. The alleged train attack plot "appears to be a manifestation of what [Osama] bin Laden advised the world some years ago — namely, that there are a handful of countries that he had wanted struck," said David Harris, an Ottawa-based lawyer and director of Insignis Strategic Research. "Canada was among them, and Canada remains the only one of the lot yet to be hit on the scale that al-Qaeda has desired," he added. 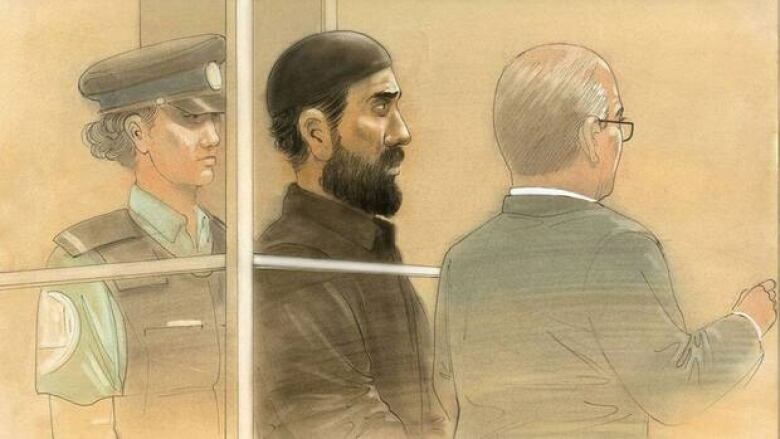 On Monday, RCMP charged Chiheb Esseghaier, 30, of Montreal, and Raed Jaser, 35, of Toronto, with conspiracy to carry out a terrorist attack and "conspiring to murder persons unknown for the benefit of, at the direction of, or in association with a terrorist group." U.S. law enforcement and national security sources told Reuters that these individuals were targeting a rail line between Toronto and New York. RCMP Assistant Commissioner James Malizia said the two accused were getting "direction and guidance" from al-Qaeda elements in Iran. Since the details of the plot were revealed on Monday, many commentators have remarked on how unusual it is that al-Qaeda, a Sunni Muslim organization formed by Osama bin Laden, would have a presence in Iran, a country made up largely of Shia Muslims. Canadian security expert Wesley Wark says the notion of al-Qaeda as a centralized command structure that authorizes and carries out attacks in Western countries is "a thing of the past." He says that even before bin Laden's death in 2011, the group had splintered off into localized factions, such as al-Qaeda in the Islamic Maghreb or al-Qaeda in the Arabian Peninsula, that were more focused on insurgencies in countries such as Mali or Yemen. "From my perspective, I don't think al-Qaeda affiliates are likely to target Canada. I think their operations will be primarily on regional environments," says Wark. What's fuelling prospective Muslim radicals in Canada, he says, is the "al-Qaeda narrative" — namely, the legacy and inspiration of bin Laden. Wark says this narrative had a great influence on the Toronto 18, a group that attempted to create an al-Qaeda-type cell in Toronto and carry out attacks on Canadian landmarks; as well as on Mohmin Khawaja, the Canadian-born computer programmer who was convicted in 2008 of financing and facilitating terrorist activities in London. Dawson, who is based in the department of sociology and legal studies at the University of Waterloo, has looked at case studies of extremists and heard from many experts in the field of radicalization. He says that in the absence of a top-down recruitment drive, the self-appointed jihadis inspired by al-Qaeda often become "middlemen," taking it upon themselves to seek out people willing to carry out attacks. These middlemen "are pretty adept at using the internet, they've had conversations in chat forums and they become sort of entrepreneurs," says Dawson. "They're the ones that get in contact with younger people. Conversations are had, and they discover whether they're dealing with a young person somewhere and whether their commitment [to the cause] is sincere. " Once the middleman is convinced the recruit is serious, Dawson says it could lead to a "referral" to a more senior operative who could provide the young radical with training and guidance. Jabeur Fathally, a law professor at the University of Ottawa, believes this country's experiences with radicalization can be partly attributed to the fallout of the Arab Spring, as well as Canada's generous immigration policies. Under such former authoritarian leaders as Hosni Mubarak in Egypt and Moammar Gadhafi in Libya, for example, people that these regimes deemed radical Muslims were often persecuted and denied passports. But since the overthrow of such strongmen, many Islamist parties have come to power in the Middle East, and have encouraged many of their previously persecuted citizens to study, work or otherwise do business in immigrant-friendly countries such as Canada. While not all of them are radicals, Fathally says that at least some have sympathies with more hardline, Islamist thought. "These people can fly easily, they can go to Turkey, they can move easily to Europe, and they can come easily to Canada," says Fathally. However, despite the recent media coverage of al-Qaeda-inspired plots in Canada, Wark doesn't believe that these individuals pose the same existential threat that bin Laden's group did in its heyday. "I think they are a lesser threat than an organized, professional, trained network of the kind that al-Qaeda once was," he says. "It's a challenge to uncover them, but the danger that they present is of a smaller degree."